Assessing yield potential is extremely difficult and totally subjective, but experience and some basic information can lead to a better decision. 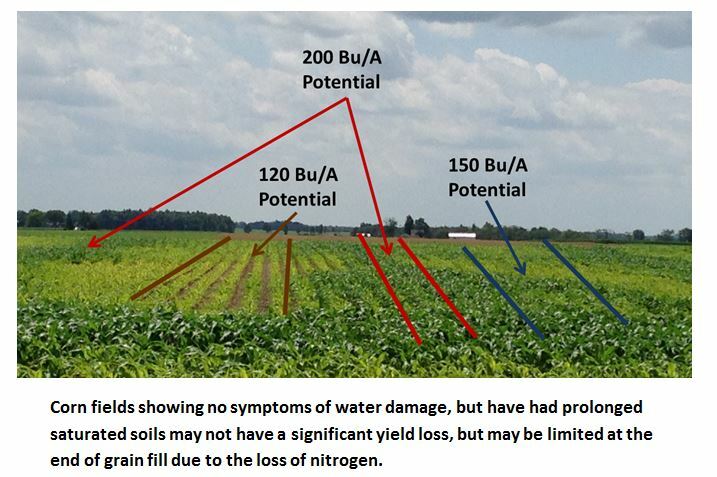 When a grower is faced with saturated to ponded soils during the early stages of corn growth and development, N is not the limiting factor. Oxygen is actually the limiting factor at this stage. Corn roots are a respiring organ and thus “breathe” oxygen to survive. When the soil is saturated with water, all the oxygen has been forced out of the pore spaces and none is available for the plant roots, this can occur within 48 hours of the soil being saturated. Once oxygen is depleted, the corn plant is living on borrowed time. Most agree that corn can survive around 4 days of ponded water with relatively cool temperatures and less as the temperatures climb above 80 F.
When corn plants are subjected to oxygen stress during ear development, the plant will lessen the number of kernels each plant will produce to compensate for the less than ideal growing conditions. But once a corn plant has aborted kernels and there is no way to regain them, all hope is not lost. There is still a lot of time to make each kernel bigger and drive yield through kernel size instead of kernel numbers. Below are some arbitrary numbers that represent real life scenarios that have been experienced under extended saturated soils. The numbers are only to help a grower decide how much yield potential their particular field may still have. This information allows more reliable decisions to be made. 2. Understand the different fates on N sources. Nitrogen or NO3- has a negative charge, and since the soil also has a negative charge, the two repel each other and nitrate N is very mobile in the soil solution. The majority of N loss is associated with the nitrate form. Ammonium or NH4+ is a very stable form of N. It has a positive charge and it therefore attaches to the soil. Ammonium N will be converted to Nitrate N in the soil, and the speed of that process depends mainly on the soil temperature. 3. Determine the amount of N that is in the nitrate form. To determine the amount of N that has been converted to nitrate N, multiple the total units of N applied by the percentage that best fits your N source and timing from the graph below. 4. Estimate how much of the applied N has potentially been lost. First determine how many units of nitrogen that have been applied are in the nitrate form from No. 3. Then multiply the amount of nitrate N by the percent nitrate loss in the next graph. So if 160 units were applied and 72 units are lost, then there are 88 units left to grow the corn crop. 5. Adjust the N program to maximize performance. When the growing season gets challenging and the corn crop is looking tough, growers tend to want to give up on the crop. But when N is the limiting yield factor, there is hope. A 2010 Purdue University study demonstrated that a V15 application of N yielded 100 bushels more than the starter-only control, and only 13 bushels less than the V7 application of the same amount of N. A study conducted by the university in 2007 showed a 64-bushel advantage when the N was applied at V13 vs. the starter-only control and 18 bushels less than the V3 sidedress application. Plan on providing at least 1 pound of N per expected bushel of corn with the combination of residual N plus any rescue treatments. As a general rule, if the soil is saturated and considerable N has potentially been lost, across the board the recommendation is to add an additional 30-50 units. When using UAN (28%), drops are a must. Any UAN that is applied to the corn foliage will burn, and if a significant amount of the plant is burned, there is a proportional yield loss associated with it. When applying urea broadcast, 100-125 pounds of product will provide the least amount of foliage burn; higher rates will increase burn and could harm yields. The addition of ammonium sulfate in a broadcast application is also beneficial for its stability and ability to provide some much needed sulfur. The use of controlled released urea is not recommended in a rescue situation due to the delay between application and the release of the N to the corn crop. 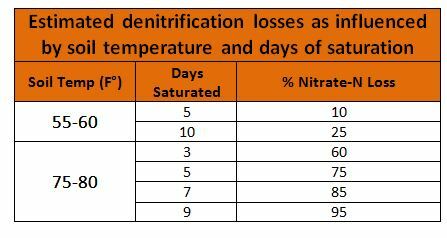 In a N rescue situation where yields have been lowered due to water damage, the addition of any stabilizer and/or urease inhibitors may not provide any economic returns and the cost/benefits should be weighed before using them. The take-home message is not to give up on a corn crop, but to ensure that everything is being done to help it maximize yield and provide the highest return possible.